Commissionated by his Excelleny S^r William Phips ???? Wills and Letters of Administration within the County of Suffolk &c.
Singular the Goods, Chattels, Rights and Credits aforesaid. Fourteenth day of October 1692. She will cause it to be added. Boston 13^th Octob^r 1692 Jurat Cor. 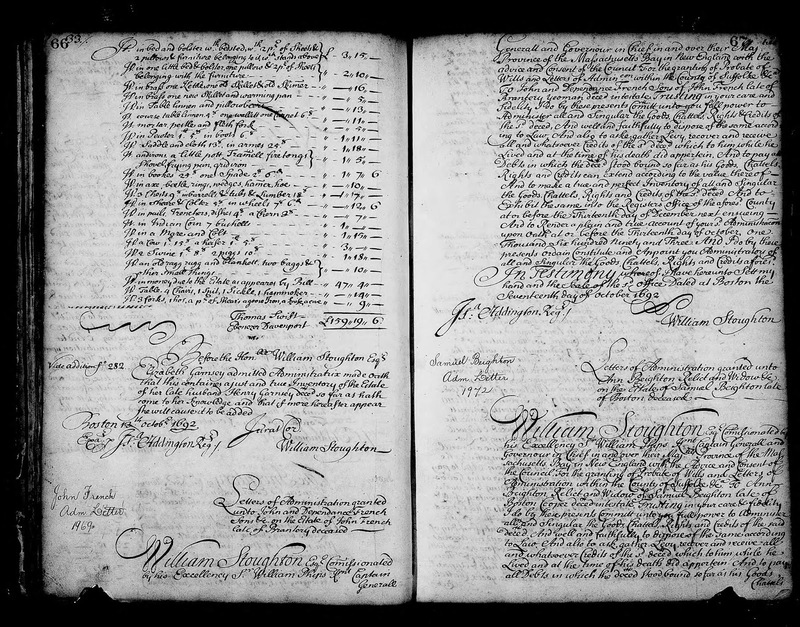 "Massachusetts, Wills and Probate Records, 1635-1991," indexed database with digital images, Ancestry.com (http://www.ancestry.com), Suffolk > Probate Records, Vol 13-14, 1688-1701, Volume 13, pages 65-66 (images 45-46 of 652), Henry Garnsey probate papers. 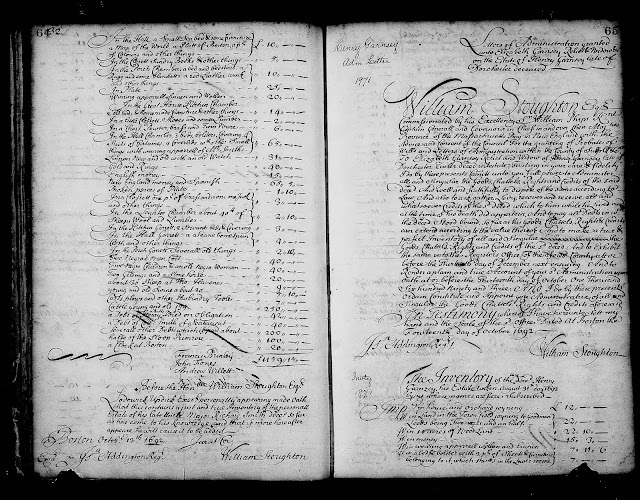 These two pages contain the Letter of Administration and the Inventory on the intestate estate of Henry Garnsey (1620-1692) of Dorchestrer, Massachusetts. Henry's second wife, Elizabeth --?--, was named the administrator of the estate. The inventory totaled £56..10 in real estate, and £103..9..6 in personal property. There are no heirs mentioned in this probate record. No account was found in the index for these probate records. 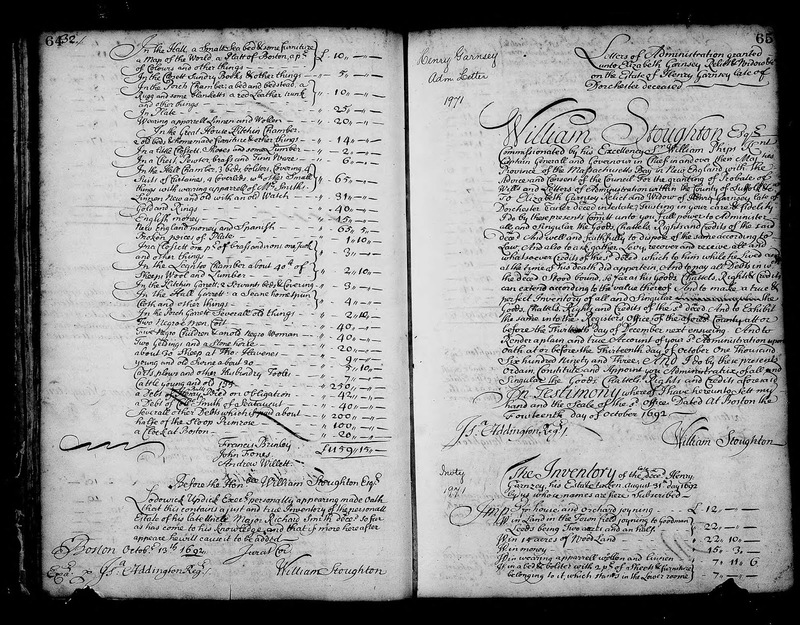 Henry Garnsey (1620-1692) is my 9th great-grandfather who had John Garnsey (1648-1722) by his first wife, Hannah Munnings (1629-1686). John Garnsey is my 8th great-grandfather. Thank you. I appreciate your work on this.